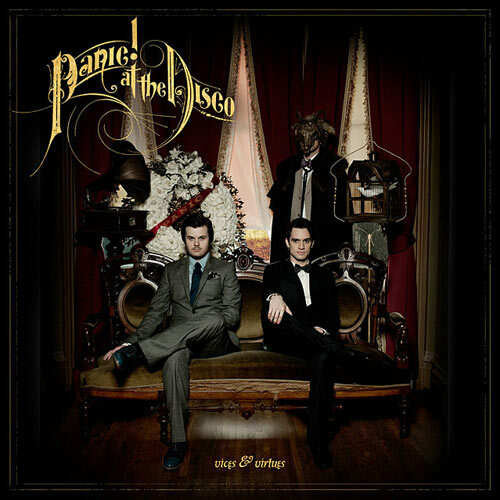 Vices & Virtues is the eagerly anticipated third album from avant-garde alt-rockers Panic! at the Disco. It’s the follow-up to their 2008 sophomore effort Pretty.Odd, and their first since the departure of former chief lyricist Ryan Ross and bassist Jon Walker, leaving lead vocalist Brendon Urie and drummer Spencer Smith to fend for themselves. After many had written the band off, curious eyes and ears have been eagerly awaiting the band’s next career move. As it turns out, the former band members’ departure wasn’t as detrimental as fans may have feared. Vices & Virtues combines the best and most memorable elements of Panic! at the Disco’s previous two full-length releases, and the end result is their catchiest and most accessible effort to date. The album’s theme revolves around good versus bad, while each of the 10 tracks contain at least one of multiple vices (including lust, greed, and anger), and explores the contrast between darkness and light throughout its duration. Produced by Butch Walker, (All-American Rejects, The Academy Is, Weezer), and John Feldman, (Goldfinger, The Used, Story of the Year), Vices & Virtues is full of lush string arrangements, various musical interludes, and multiple layers of background vocals, all of which ultimately make this a very theatrical and dramatic work of musical pop art. Front man Brendan Urie takes over lyrical duties successfully and confidently. The habitually contrived pretentiousness of Ryan Ross’ clever, but often disaffected riddle-like limericks are noticeably absent, but that doesn’t mean clever lyrics aren’t to be found here. Urie demonstrates his own knack for writing crafty phrases such as “Mona Lisa wear me out I’m pleased to please you/I’d pay to see you frown/There’s nothing wrong with just a taste of what you paid for,” which he delivers with dynamic vocal cadence in the hit leadoff single “The Ballad of Mona Lisa.” The insanely hummable chorus of the upbeat “Memories,” may be the group’s most hook-laden tune to date, and sounds as if it has the potential for crossing over musical genres and introducing Panic! to new audiences. “Oh memories where’d you go/You were all I’ve ever known/How I miss yesterday and how I let it fade away,” Urie sings with an irresistible combination of remorse and buoyancy. The second half of the program begins with the dance-like beat of “Ready To Go (Get Me Out of My Mind,” which sounds like it borrows a page from The Killers’ catalog of hits, before abruptly shifting musical gears and segueing into the acoustic ballad “Always,” which is performed in the sparsely produced style of Plain White T’s “Hey There Delilah.” And of course, no Panic! album would be complete without an eclectic musical theater number, found here in “Sarah Smiles,” a song Urie wrote to impress his girlfriend. “ I was fine, just a guy living on my own/Waiting for the sky to fall/Then you called, changed it all doll/Velvet lips, the eyes to pull me in/We both know you’d already win/Oh you’re original sin,” Urie laments in this personal love letter. Vices & Virtues is a multi-faceted piece of work that is Panic! at the Disco’s most thematically cohesive and polished collection of uniquely eccentric, but meticulously crafted songs to date. It’s a multi-faceted musical eargasm without a dud anywhere on its track list. Fervent fans will want to invest the time and effort required to seek out the six extra tracks found on various deluxe versions of the album.